Heat oven to 375°F (350°F for dark or nonstick pans). In large bowl, mix about half of the dry cake mix, the shortening, butter, vanilla and egg, using spoon, until thoroughly mixed. Stir in remaining cake mix. Break up any lumps with fork. Divide dough in half. On lightly floured cloth-covered board, roll each half 1/4 inch thick with cloth-covered rolling pin. 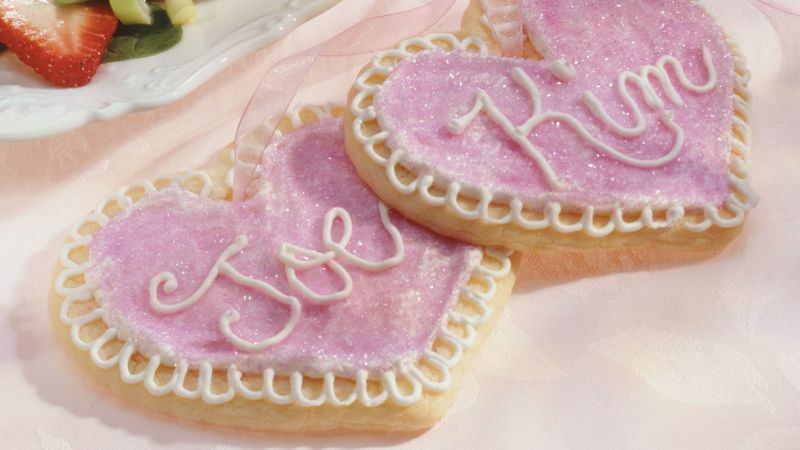 Cut dough with 2 1/2-inch bell- or heart-shaped cookie cutter. Place 1 inch apart on ungreased cookie sheets. Bake 6 to 8 minutes or just until set (centers will be soft). Remove from cookie sheets to cooling rack. Cool completely, about 30 minutes. Decorate cookies with frosting. Store loosely covered. Pipe guests' names on frosted cookies for unique place cards (and great munching at the end of the meal). You can try as many variations of these cookies as there are reasons to celebrate. Sprinkle with red decorator candies for Valentine's Day, green candies for St. Patrick's Day, yellow for Easter--the possibilities are endless!